Russian earth land resources satellite. The Resurs-F earth resource satellite was based on the recoverable Zenit-4 spy satellite. Earth Observation (film return) satellite built by TsSKB, Russia. Launched 1986 - 1988. AKA: 14F40. Status: Operational 1986. First Launch: 1986-07-10. Last Launch: 1988-02-18. Number: 7 . Gross mass: 6,300 kg (13,800 lb). Film resolution was 10-11 m black and white, 31-33 m multispectral. Swath width 147 to 225 km; total area covered per mission 27 to 76 million square km. A restartable engine allowed adjustment of orbit during mission. A decree of 5 May 1977 authorized development of three earth resource satellites. The Ministry of Defense was tasked with developing these systems, even though they did not contribute directly to any military mission. Despite this political decision, the orders were followed. One of these was Resurs-F, which became Fram, based on the recoverable Zenit-4 spy satellite. 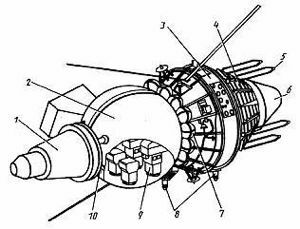 The spacecraft's mission was investigation of the natural resources of the earth in the interests of various branches of the national economy of the USSR and international cooperation. Typical orbital profile: inclination 81.3 to 82.6 degrees with altitude of 180-235 km or 185-280 km; maneuvering to an altitude of 260-275 km or 180-280 km; maneuvering to an altitude of 325-340 km. First flight: Cosmos 1762. Last flight: Cosmos 1920. Transmission frequencies observed in West: 231.5 PCM-FM. With two missions in 1993, the Resurs-F1 program achieved 50 orbital flights (and two launch failures) during its 14-year operation with missions lasting up to 23 days. Based on the Vostok spacecraft developed in the late 1950's, Resurs-F1 spacecraft were designed and manufactured at the Samara (formerly Kuibyshev) Foton Design Bureau and the Progress Plant both of the Central Specialized Design Bureau. The Resurs-F1 vehicle, launched by the Soyuz-U booster from Plesetsk, was 7 m long with a maximum diameter of 2.4 m and a mass of 6,300 kg and was comprised of three major modules. The central portion of the spacecraft was a sphere of 2.3 m diameter and a mass of about 2.4 metric tons containing the photographic apparatus, electronic control equipment, and the recovery system. This section was secured to a 3 m long, 2.4 m wide service and re-entry propulsion module with four straps which were released after retrofire. On the opposite end of the recoverable capsule was a 1.9 m by 1 m propulsion unit used for minor orbital adjustments. The propulsion unit was also jettisoned prior to re-entry and could carry additional, releasable payloads (up to 75 cm by 90 cm) for secondary missions. Secondary payloads up to 30 kg or more could also be carried inside or outside the recoverable capsule for return to Earth. Two photographic systems were normally available on Resurs-F1 missions: the SA-20M with a KFA-1000 camera and the SA-34 with its KATE-200 camera. The former operated in two spectral bands (0.57-0.68 micrometer and 0.68-0.81 micrometer) with a ground swath of 80 km and a resolution of 5-8 m. Up to 1,800 frames measuring 300 mm by 300 mm could be taken on each mission. The SA-34 operated in three spectral bands (0.51-0.60 micrometer, 0.60-0.70 micrometer, and 0.70- 0.85 micrometer) with a ground swath of 225 km and a resolution of 15-30 m. The SA-34 had a capacity of 1,200 frames, each 180 mm by 180 mm. All film frames of both systems were etched with codes to identify vital camera parameters, including camera and frame number, film number, focal length, and timing codes. Each Resurs-F1 spacecraft carried multiple camera systems. The Priroda 4 payload configuration included two SA-20M and three SA-34 devices. One of the SA-34's was linked to a SA-33 stellar camera to provide simultaneous star backgrounds for precise geographical location determination. The SA-34 survey regions were aligned with common axes, but the SA-20M cameras were each oriented 8 degrees off nadir for a total separation of 16 degrees between the camera axes, permitting a 5% image overlap when both systems were operated simultaneously. Six modes of operation were possible with 2-5 camera systems operating at one time. Although the maximum spacecraft lifetime was 25 days, the electrical system fed only by storage batteries limited active operations to no more than 14 days. The last two Resurs-F1 missions were flown in 1993 as Resurs-F 18 (June-July) and Resurs-F 19 (August-September, both on 17 day missions. Spacecraft delta v: 114 m/s (374 ft/sec). Family: Earth, Earth land resource sat, Surveillance orbit. Country: Russia. Engines: 11D82M. Launch Vehicles: R-7, Soyuz-U, Soyuz-U-PVB. Projects: Resurs. Launch Sites: Plesetsk, Plesetsk LC43/4, Plesetsk LC43/3, Plesetsk LC16/2. Agency: MOM, Kozlov bureau. Bibliography: 102, 2, 279, 374, 6, 13012. 1986 July 10 - . 08:00 GMT - . Launch Site: Plesetsk. Launch Complex: Plesetsk LC16/2. LV Family: R-7. Launch Vehicle: Soyuz-U-PVB. Cosmos 1762 - . Mass: 6,300 kg (13,800 lb). Nation: Russia. Agency: MOM. Program: Resurs. Class: Earth. Type: Earth resources satellite. Spacecraft Bus: Vostok. Spacecraft: Resurs F1-14F40. Duration: 8.00 days. Decay Date: 1986-07-24 . USAF Sat Cat: 16855 . COSPAR: 1986-051A. Apogee: 263 km (163 mi). Perigee: 177 km (109 mi). Inclination: 82.50 deg. Period: 88.90 min. Investigation of the natural resources of the earth in the interests of various branches of the national economy of the USSR and international cooperation. .
1986 August 2 - . 09:20 GMT - . Launch Site: Plesetsk. Launch Complex: Plesetsk LC16/2. LV Family: R-7. Launch Vehicle: Soyuz-U-PVB. Cosmos 1768 - . Mass: 6,300 kg (13,800 lb). Nation: Russia. Agency: MOM. Program: Resurs. Class: Earth. Type: Earth resources satellite. Spacecraft Bus: Vostok. Spacecraft: Resurs F1-14F40. Duration: 14.00 days. Decay Date: 1986-08-16 . USAF Sat Cat: 16890 . COSPAR: 1986-058A. Apogee: 273 km (169 mi). Perigee: 180 km (110 mi). Inclination: 82.60 deg. Period: 89.00 min. Investigation of the natural resources of the earth in the interests of various branches of the national economy of the USSR and international cooperation. .
1986 October 31 - . 08:00 GMT - . Launch Site: Plesetsk. Launch Complex: Plesetsk LC16/2. LV Family: R-7. Launch Vehicle: Soyuz-U-PVB. Cosmos 1789 - . Mass: 6,300 kg (13,800 lb). Nation: Russia. Agency: MOM. Program: Resurs. Class: Earth. Type: Earth resources satellite. Spacecraft Bus: Vostok. Spacecraft: Resurs F1-14F40. Duration: 14.00 days. Decay Date: 1986-11-14 . USAF Sat Cat: 17054 . COSPAR: 1986-084A. Apogee: 272 km (169 mi). Perigee: 178 km (110 mi). Inclination: 82.60 deg. Period: 89.00 min. Investigation of the natural resources of the earth in the interests of various branches of the national economy of the USSR and international cooperation. .
1987 May 21 - . 07:44 GMT - . Launch Site: Plesetsk. Launch Complex: Plesetsk LC43/4. LV Family: R-7. Launch Vehicle: Soyuz-U-PVB. Cosmos 1846 - . Mass: 6,300 kg (13,800 lb). Nation: Russia. Agency: MOM. Program: Resurs. Class: Earth. Type: Earth resources satellite. Spacecraft Bus: Vostok. Spacecraft: Resurs F1-14F40. Duration: 14.00 days. Decay Date: 1987-06-04 . USAF Sat Cat: 18004 . COSPAR: 1987-045A. Apogee: 283 km (175 mi). Perigee: 178 km (110 mi). Inclination: 82.30 deg. Period: 89.10 min. Investigation of the natural resources of the earth in the interests of various branches of the national economy of the USSR and international cooperation. .
1987 June 18 - . 07:24 GMT - . Launch Site: Plesetsk. Launch Complex: Plesetsk LC43/3. LV Family: R-7. Launch Vehicle: Soyuz-U-PVB. FAILURE: Booster exploded on pad.. Failed Stage: 0. Resurs-F1 14F40 - . Payload: Resurs-F1 14F40 No. 105. Mass: 6,300 kg (13,800 lb). Nation: Russia. Agency: UNKS. Program: Resurs. Spacecraft Bus: Vostok. Spacecraft: Resurs F1-14F40. Pad was badly damaged and not put back into service until December 1988..
1987 September 15 - . 10:30 GMT - . Launch Site: Plesetsk. Launch Complex: Plesetsk LC43/4. LV Family: R-7. Launch Vehicle: Soyuz-U-PVB. Cosmos 1882 - . Mass: 6,300 kg (13,800 lb). Nation: Russia. Agency: MOM. Program: Resurs. Class: Earth. Type: Earth resources satellite. Spacecraft Bus: Vostok. Spacecraft: Resurs F1-14F40. Duration: 21.00 days. Decay Date: 1987-10-06 . USAF Sat Cat: 18348 . COSPAR: 1987-077A. Apogee: 269 km (167 mi). Perigee: 253 km (157 mi). Inclination: 82.30 deg. Period: 89.70 min. Investigation of the natural resources of the earth in the interests of various branches of the national economy of the USSR and international cooperation. .
1988 February 18 - . 09:50 GMT - . Launch Site: Plesetsk. Launch Complex: Plesetsk LC16/2. LV Family: R-7. Launch Vehicle: Soyuz-U-PVB. Cosmos 1920 - . Mass: 6,300 kg (13,800 lb). Nation: Russia. Agency: MOM. Program: Resurs. Class: Earth. Type: Earth resources satellite. Spacecraft Bus: Vostok. Spacecraft: Resurs F1-14F40. Duration: 20.00 days. Decay Date: 1988-03-09 . USAF Sat Cat: 18860 . COSPAR: 1988-010A. Apogee: 232 km (144 mi). Perigee: 185 km (114 mi). Inclination: 82.60 deg. Period: 88.70 min. Investigation of the natural resources of the earth in the interests of various branches of the national economy of the USSR and international cooperation. .